Peel and dice the sweet potatoes. Boil these in water until they start to go soft but still hold their shape. Set to one side. Peel and finely slice the onions. Place in a pan with a little oil, and fry until translucent. Then add the garlic and corned beef and break up the lump of corned beef until it’s the consistency of mince. Then add the cubed, par-boiled sweet potatoes. If the corned beef starts to stick to the pan, add more oil (or a little water). Add salt and pepper and the first generous squirt of tomato ketchup (about a desert spoon full). Crack in the eggs, and keep stirring the hash so the egg breaks up and is spread through. Add another generous squirt of tomato ketchup. 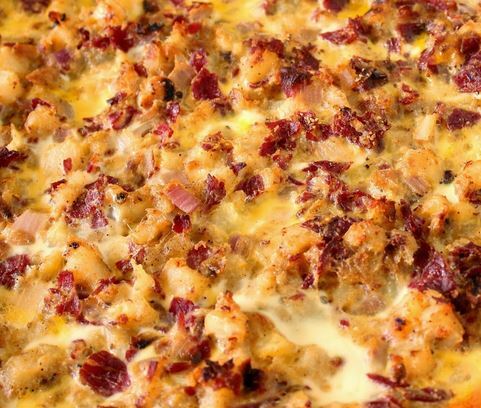 When the corned beef and potatoes are well cooked, throw in a handful of grated cheddar and continue to stir. Serve with crusty bread and butter. The tomato ketchup is a key ingredient and really does add to the flavour during the cooking process. It’s possible other brands of ketchup will do, but I haven’t found one yet which is better. Trust me, it’s the (now) not so secret ingredient which makes this meal explode with flavour.